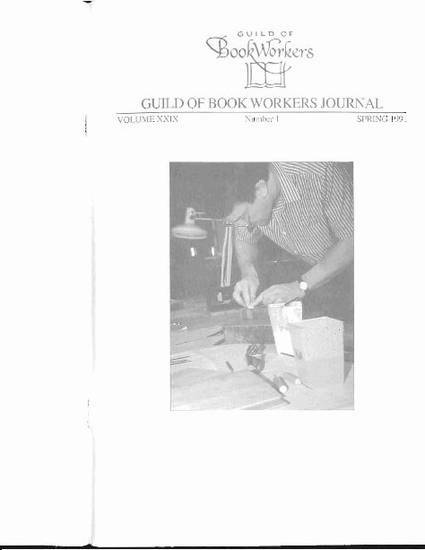 In October of 1989, at the Guild of Book Workers' Standards of Excellence Seminar, Betsy Palmer Eldridge gave a presentation on "Basic Paper Treatments for Printed Book Materials." This 2 1/2 hour presentation was a very ambitious undertaking, but she did a magnificent job. Since these presentations and the synopses that later appeared in the GBW Newsletter, there has been some discussion. The presentations and these articles are not to be construed as a "how to" of basic paper conservation but rather as an introduction for those with interest but little experience. For the more experienced, they present the methods of the individual conservator for dealing with common problems. None of these methods is the only way to carry out a specific treatment. Each project has its own challenges and no two are alike. It is therefore important to continue to build our knowledge through both reading and the lessons of experience. To facilitate our understanding and to allow us to concentrate on the demonstrations as they were performed, Betsy Palmer Eldridge provided us with a very detailed and useful outline. Her presentation was divided into 12 sections that introduced the major problems and treatments that book conservators might be faced with when working with paper.